Kit comes with Zoo Med's Mini Deep Dome Lamp Fixture and Repti Basking Spot Lamp (75 watt). 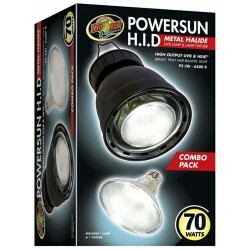 Kit comes with Zoo Med's Deep Dome Lamp Fixture and ReptiSun 10.0 Compact Fluorescent (26 watt). 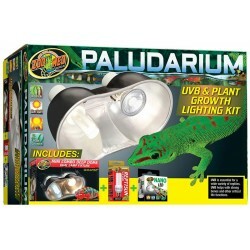 Zoo Med's Paludarium UVB & Plant Growth Lighting Kit includes the following: Mini Combo Deep Dome Dual Lamp Fixture, Reptisun 5.0 Compact Mini UVB and Zoo Med's Nano LED 5 watt.